Acne can be an extremely distressing condition and can happen to any of us and any time in our lives. Whatever the stimulus (whether it be natural hormonal changes, stress, diet etc.) the cause is always a rise in testosterone which leads to an increase in dead skin cells and an increase in the amount and thickness of sebum (oil). 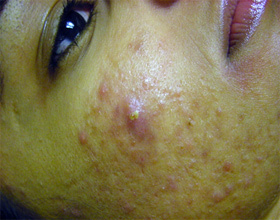 This leads to blocking of the pores and eventually the vicious cycle of p.acne bacteria is triggered. Many traditional treaments for acne have serious side effects and may not be that effective. 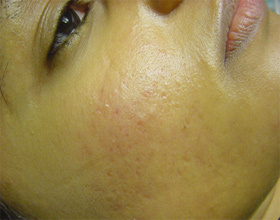 A good home care regime along with clinical treatments can often reduce and often completely clear acne. There needs to be a 3 pronged approach. Normalising dead skin cells and oil production through the use of lactic acid and Retin A found in clinic based treatments and home care products. Once again, a Professional Consultation is essential to assess your Acne and give personalised advice. LED Light Therapy (or Photo Dynamic Therapy) works on a host of conditions, including acne and acne scarring. It uses specific colour wavelengths of light that penetrate the skin at varying depths. Blue light is a well-established technology for improving and potentially managing types of acne, and is now starting to be used within the beauty industry as more people are seeking alternative therapies in place of prescription medication. The technology derived from NASA proves that when our skin cells are exposed to Blue light it has a positive effect reducing bacteria. Photo Dynamic Therapy uses a low level of laser opposed to just a light therapy which only targets the skin's surface. Blue diode laser wavelengths boost the immune system and penetrate through the skin's dermal layer and specifically target the bacteria causing the acne. The Blue light also promotes cell regeneration and reduces inflammation. Red and blue light when used in combination have synergistic effects in treatment of acne.